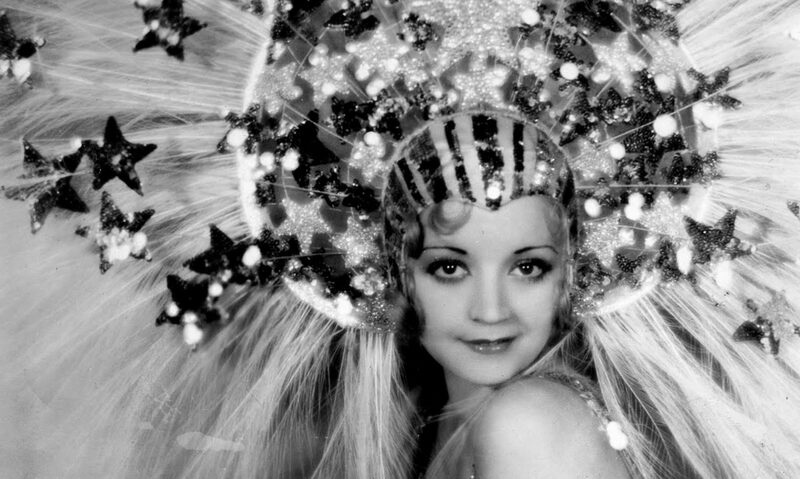 Everyone is drinkin’ at speakeasies. A lot of the characters have been through a divorce or two. Jojo is threatened with a kick ‘in the differential!’. There’s a lengthy harem fantasy sequence with Winnie shaking her rear end. While watching her doing her thing, Jojo picks up the phone and orders 1,000 shares of ‘American can’. This is shortly followed by Brown stroking those feathers in his turban in a highly suggestive way. Jojo’s utter lack of skill at wrestling is attributed to his emasculated manner. He wears shirts and robes covered in flowers. And he manages to win one match only by virtue of being so dizzy, he starts to kiss his opponent. He’ll even lay it on Torchy Blaine’s Officer Gahagan, AKA Tom Kennedy! The box for the Warner Archive release of Sit Tight focuses on the fact that the movie was once a musical about wrestling– probably because the film is more interesting for what it isn’t than what it is. But, yes, like 50 Million Frenchmen, the musical sequences (save for one brief ditty from Winnie Lightner) were all removed prior to the film’s American release. The general movie going public had been inundated with an unending succession of painful musicals and revolted. 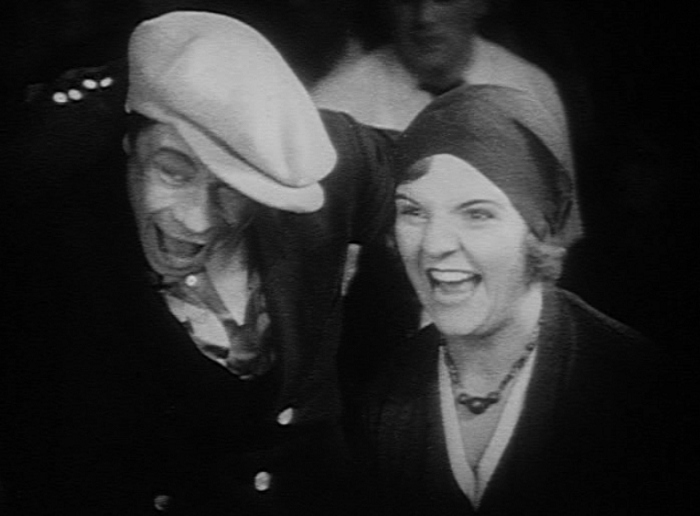 And, frankly, I’m starting to feel the same way about Joe E. Brown’s movies. I’ve hit on three others here, Eleven Men and a Girl, Elmer the Great, and Fireman, Save My Child, all of which showcased the same brash personality: big mouth, big ego, excellent physical chops, and a screech that sends pets scurrying. I’ve compared him to Jim Carrey and French Stewart, comedians with a schtick that seems fine tuned for adolescents and not much else. And I guess I’m getting old. If I were eight or nine, I would be yucking it up. But now he just feels like a stooge in search of two other nuts to counterbalance some of his lengthy, punchline-free routines. I’m pretty sure this act is still illegal in parts of Ohio. I’d picked this up in hopes that Winnie Lightner may be able to pull of that trick. 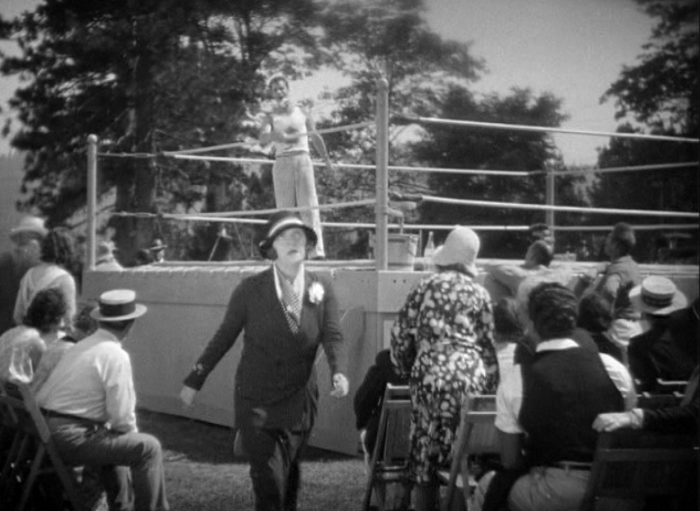 Lightner, who I fell head over heels for back with Gold Dust Gertie, is loud, brash and quick with the comeback. Unfortunately for Sit Tight, she’s shunted off more often than not so we’re treated to another lengthy scene of Joe E. Brown bragging about something and then getting creamed in the face– all before an inevitable and mandatory victory. 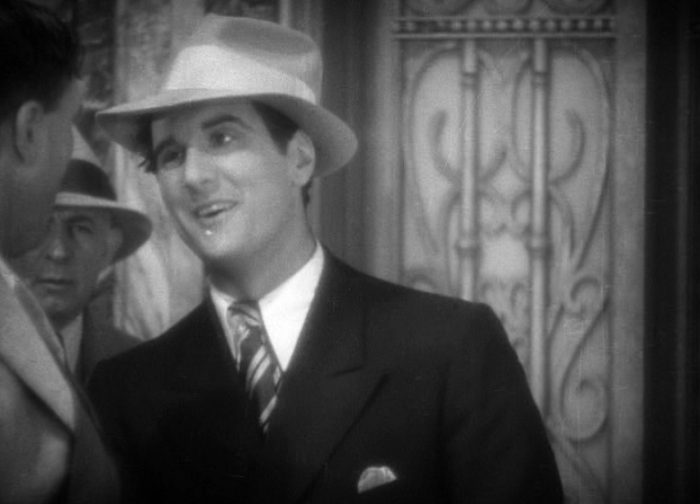 Even worse is the fact that this film is another example of “The Marx Brothers Corollary of the Superfluous Romantic Couple”. This rule reads that any time the filmmakers don’t trust the comedians to fully engage the audience, a bland romance is inserted to help grease the wheels. The couple is young cute, very white, and very in love, with one small thing keeping them apart, which is almost always either social class or just a slight misunderstanding. A clear part of the corollary also reads that, despite being a comedy, these characters are not funny (though they think the comedians in our film are funny!) and must go through their plot arc with supreme dramatic flourish. Sally is huffed for a bit at Joe’s insistence on an inspection, but she’s much more obsessed with getting Tom out of wrestling. 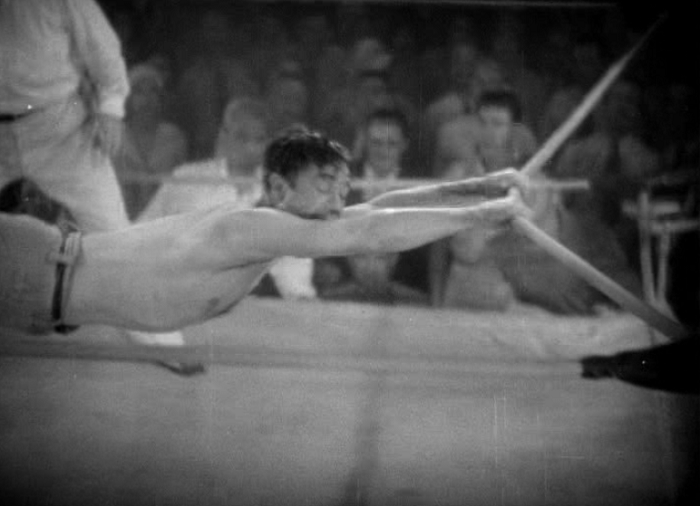 The movie’s vision of wrestling is a bit more pure than what we get nowadays– not a collapsible chair or Mickey Rourke in sight– but it’s not too thrilling when we know the film’s plot and can pick the winners out in the first reel. It’s hard to care about reversal after reversal when you didn’t care about the match to begin with. There’s also Winnie Lightner. Though she doesn’t get to do too much besides be loud and angry, she does get to do that harem dance I posted up above. As someone who’s not what movies would consider conventionally beautiful, you can tell she’s really relishing the chance to vamp it up for a bit as a dancer named ‘Miami’. The film is obviously put together by talented, smart people, but it still did a jig on my last nerve. The lengthy Tom/Sally subplot is mechanical, and Sally’s pettiness is funnier than many of the film’s intentional jokes. Many of those gags, like Brown not being able to figure out which phone is ringing or bragging about a terrible performance in the wrestling ring, drag. This film is pretty much made for those who find his schtick hilarious. But I do really wish they’d left the musical numbers in. The film couldn’t have been much worse. 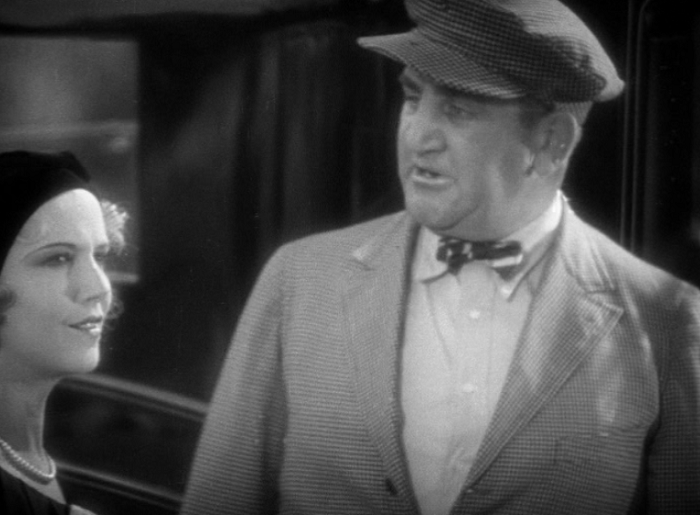 At one point, when Tom’s courage is called into question, Winnie counters, “Tom is one of the whitest men I know!” Which is not a phrase I’d heard before, let alone have heard since. 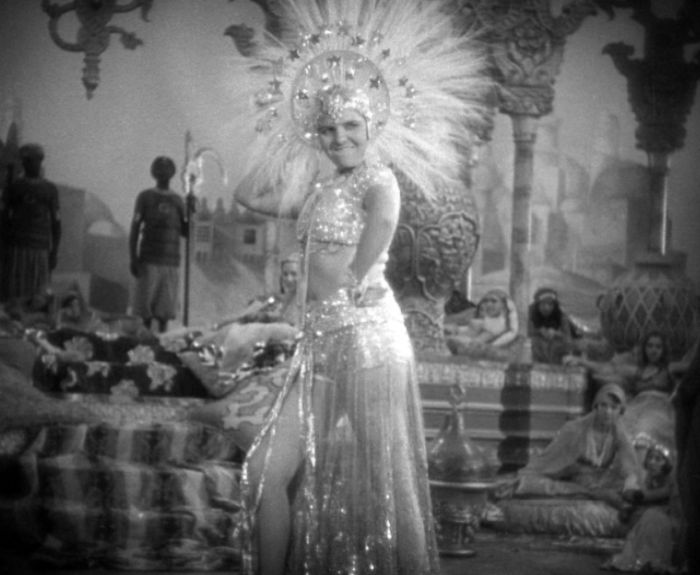 The film reuses sets from Kismet (1930) for the harem sequences. 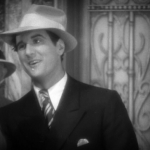 There’s a thread over at Nitrate Ville about how the film’s DVD release may not be in the right ratio. The DVD also has plenty of noise and specks, but, I’ll be honest here, it pretty much got the best release the film deserved.